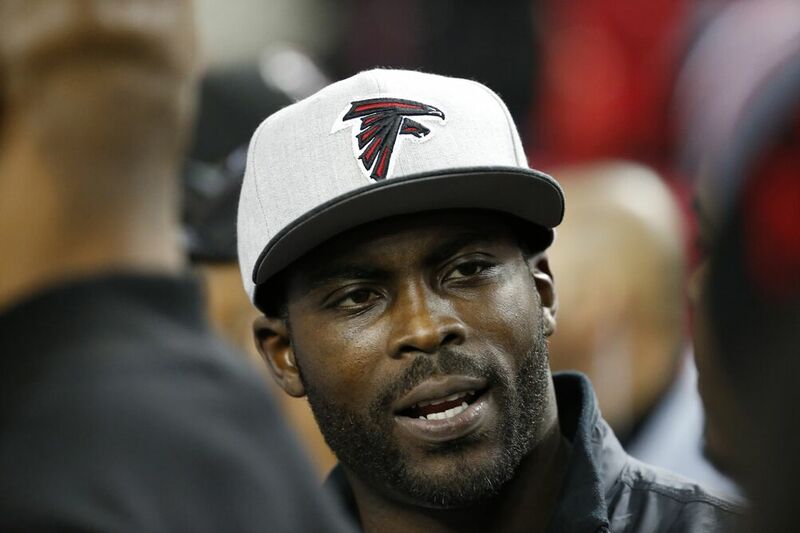 Michael Vick retired as a member of the Atlanta Falcons on a one-day contract on Monday. Here are the five best moments of his unforgettable NFL career. Many of us never thought we’d see it happen, but former Atlanta Falcons quarterback Michael Vick retired with the team that drafted him on Monday in a special ceremony. Vick and former Falcons star wide receiver Roddy White were honored by Falcons owner Arthur Blank for their contributions to the organization. Both signed one day contacts to retire with their favorite NFL team. While White spent his entire 11-year NFL career with the Falcons (2005-15), Vick’s stay in Atlanta was both brilliant and tumultuous. He would be the Falcons’ No. 1 overall draft pick out of Virginia Tech in 2001. Vick would make three Pro Bowls in Atlanta and lead the Falcons to two playoff berths in 2002 and 2004. However, Vick’s time as the franchise quarterback came to an end after the 2006 NFL season after he was indicted on charges of running a dog fighting operation in his native Virginia. Vick spent 21 months in federal prison from August 2007 to May 2009. After his release from prison, Vick would re-invent his football career most notably with the Philadelphia Eagles from 2009 to 2013, where he would be named 2010’s NFL Comeback Player of the Year are reach his fourth Pro Bowl. Vick would spend his final two years of his NFL career as a backup with the New York Jets (2014) and the Pittsburgh Steelers (2015). When he was on the field, Vick did things we had never seen from a quarterback. He paved the way for the dual-threat quarterback in the NFL game. Vick changed the way defenses game planned and helped unite a fan base in Atlanta when he was starring for the Falcons. Here are the five best moments of his unforgettable NFL career. 2004 was the finest year Vick has as a member of the Falcons. That fall, Atlanta went 11-5 en route to its first NFC South division crown since 2002’s realignment to account for the expansion Houston Texans. The Falcons would get the No. 2 seed in the 2004 NFC Playoffs, but fell to the rival Philadelphia Eagles in the 2004 NFC Championship at Lincoln Financial Field. This was also a year of great optimism and skepticism for both Vick and the Falcons. Many were waiting to see if Atlanta could rebound with their star mobile quarterback back on the field. Keep in mind that Vick suffered a broken right fibula in a 2003 preseason game against the Baltimore Ravens. Vick’s finest regular season game of 2004 without question came on the road in Week 8 against the Denver Broncos. It was Halloween in Denver and Vick decided to put on a historic performance that would haunt the Broncos dreams for some time. Both teams were 5-2 at that meeting. Winning at Mile High Stadium was never easy, but Vick took it upon himself that Atlanta would come out of Denver with a huge 41-28 victory. Vick became the first quarterback in NFL history to throw for more than 250 yards and rush for more than 100 yards in a single game. As a passer, Vick would complete 75 percent of his throws (18-24) for 252 yards, two touchdowns and no interceptions, boasting a 136.1 quarterback rating. On the ground, Vick would have 12 carries for 115 yards, averaging 9.6 yards per attempt.